Western_Union wrote: Is this any better? Yeah not bad. Just remember to keep those farms/mines at lvl 1. And once you get to lvl 12 you can drop to 0 rep for easy resources. Crack69 wrote: Yeah not bad. Just remember to keep those farms/mines at lvl 1. And once you get to lvl 12 you can drop to 0 rep for easy resources. What's so special about level 12? That's when you'll start seeing bases with better loot. And at low rep you'll see a lot of them with ridiculous net designs. 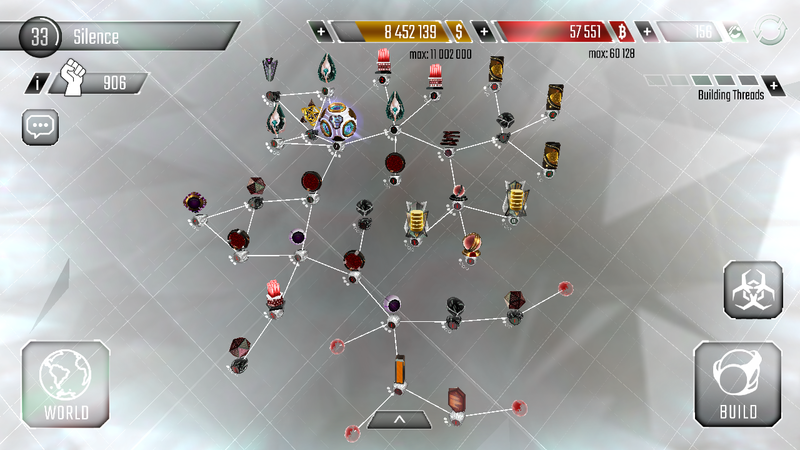 Best setup is maelstrom / tree network ? Still I'd suggest you put the high sentry instead of the turret linked to the lvl1 mine. Also don't link the lvl one Sentry to it. This way you'll take advantage of the sentry's high firewall to slow down attackers. As for what to do with that turret and sentry...I've no idea honestly. Consider putting them on net connections to free up libraries... might seem odd but libraries have a pretty good firewall also the lvl1 turret damage is virtually irrelevant compared to the av damage itself. Also keep in mind that while lvl 1 turrets and sentries still have 4 program slots libraries have only 3. Either way you're doing great so far, keep up the good work! Just thought I'd pop in and leave an update to my pasifist alt(F2P). No longer care about keeping account hidden so no name hide. The only challenge I can do is brake through 7 code gates(mission based[2 min of waiting for 2 code gates]) and the abandoned credits on map to obtain credits. Defeated defenses doesn't equal loot lost. Rep dumping is not an option as it would require hacking someone else. Even if it is a loss. This is not the last setup I'll be using. At the time of posting this I'll be upgrading both sentry and scanner(same time requirement) and a database. 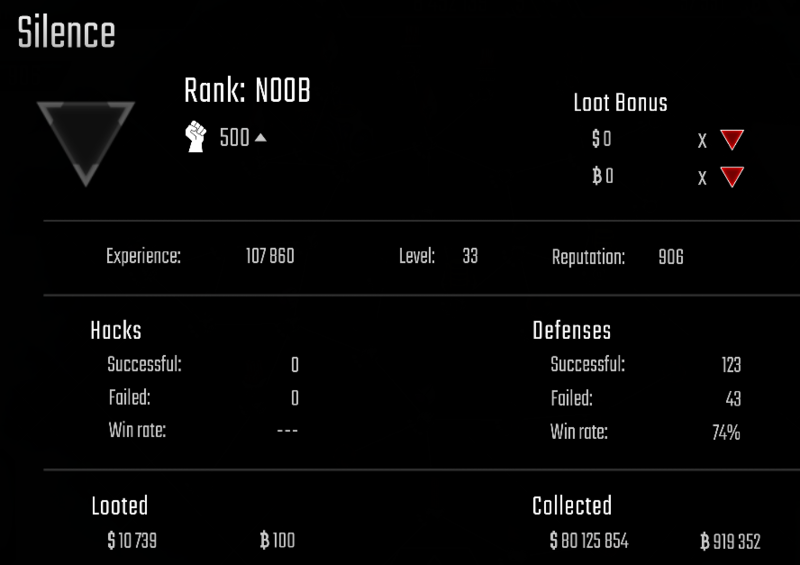 Fun Fact: You will stay ranked Noob even when past requirement if you don't finish a hack. Something I'd change looking back is to have only 2 bcoin mines. 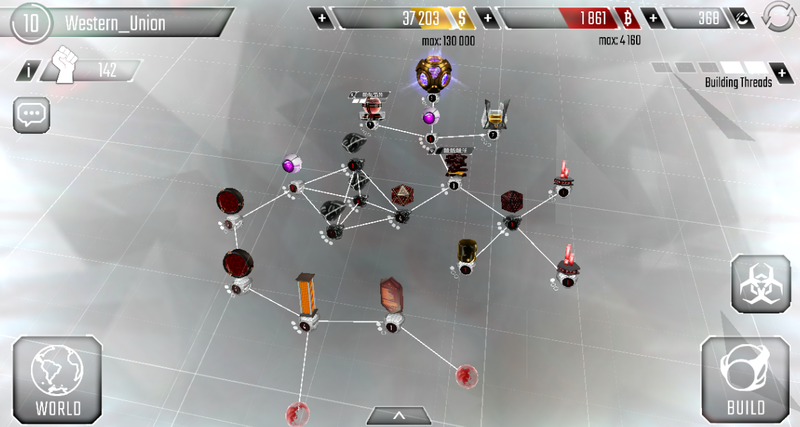 Great job zavok & great plan I like the fresh approach u have basically like on auto. Love that stats of hack rate and lost post it again when u r a few lvls higher.